The goal of the Ministry of Communications and its Departments is “The Ministry of Communications will provide the People of Bangladesh with a safe, cost effective well maintained road network”. And the department of “The Ministry of Communications” named “Roads and Highways” works for achieving this goal. The Roads and Highways Department under the Ministry of Communications is responsible for the development and maintenance of the network of the main roads and bridges of Bangladesh. The Roads and Highways Department was founded in 1962 as an offshoot of the C&B Department. The Department is responsible for the construction and maintenance of the major road network of Bangladesh. 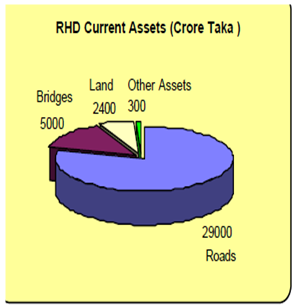 RHD is responsible for the management of the National, Regional and Zilla road network of about 21,000 Km in road length and some 18,258 bridges with annual development and revenue funds of 3,463 core Taka of which about Taka 2,547 core is from the Annual Development Budget and Taka 916 core from the Revenue Budget in fiscal year 2007-08. 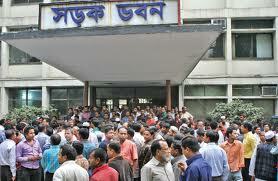 RHD has been at the fore point in Bangladesh to introduce E-governance. RHD had officially launched RHD Website in July 2003. The Website contains a wide variety of information on technical and managerial issues. This includes roads and bridges data, personal data, financial project information, different manuals, standard test procedures, design standards for roads and bridges as well as management plans for each area. The total number of posts in the Department is almost 20,000. Since the Department was founded the size of the major road network in Bangladesh has grown from approximately 4,500 kms to the present network of about 21,000 kms. The Department is headed by a Chief Engineer who is supported by a number of Additional Chief Engineers. The Department is also responsible for an annual budget of approximately Taka 2,985 crore of which about Taka 2,400 Crore is from the Annual Development Budget and Taka 300 crore from the revenue budget in financial year 2005-06. The total number of personnel in the Department is almost 20,000. “The Roads and Highways Department has a sustainable capacity to plan, manage and deliver its full range of responsibilities in respect of the main road and bridge network and to be accountable for these duties”. The Assets of the Roads and Highways Department have been conservatively estimated at Taka 37,000 crore of which by far the largest proportion is the value of about 21,000 kms of road and about 15,000 bridges. These assets are probably the greatest asset of any organisation in Bangladesh and maintaining their value is vital to its economy. This places a great responsibility on the Roads and Highways Department. In order to fulfil the objectives of the RHD the strategies of the various wings and zones must be fully implemented so that the outputs from the wings and zones contribute directly to the objectives and vision of the Department. Any Vision of the future for the Roads and Highways Department must imagine an organisation that is capable of fulfilling the objectives stated in the previous section. The Vision set out below is a statement of the various concepts, systems and procedures which are to be developed in the Roads and Highways Department in the near future. Personnel should be proud of their organisation and have a strong esprit de corps. Existing Government restrictions on recruitment will dictate future personnel numbers and it will be necessary to concentrate on the core activities of planning, setting standards, procurement and monitoring, whilst some other functions may be outsourced. Professional staff may be encouraged to spend a period on deputation with the private sector as part of their personal development. Specialists will be developed in a number of areas and postings will be made in a coordinated and planned manner. All personnel will receive appropriate job related and CPD training organised by the RHD training centre. The current sanctioned staff of the Department totals 9,331 comprising 573 Class I, 773 Class II, 4,759 Class III and 3,226 Class IV personnel. Out of this total figure there are currently about 2,800 vacant posts all excepting about 150 of which are from Class III and Class IV staff. These figures for sanctioned staff however mask the fact that there are currently about 12,000 ‘temporary’ (work charged, muster roll and casual staff) employed by the Department giving a total of about 18,000 staff currently engaged. Because of the Government restrictions on recruitment of Class III and Class IV staff and the total ban on recruitment of temporary staff most staff are now over 40 years of age and there is an increasing rate of retirement which should result in major changes in staff numbers during the next 5-10 years. There are many support staff in the Department but there is a shortage of skilled and experienced administrative support staff. During the past few years technology has changed but little has been done to develop those support activities which are essential to the efficient operation of the Department. Training and development of support staff is an important aspect of the RHD Strategy. The Strategy is also to make a number of improvements in the designations and grades of some personnel. In particular some of the non engineering cadre officers (eg economics, arboriculture) should be brought into line with the equivalent engineering personnel in terms of grades and pay scales. There is also a long standing anomaly with the Assistant Research Officers (AROs) at the BRRL who are designated as Class III staff although their education and training indicates that they should clearly be Class II officers. Allow full and equitable opportunities for professional development of all RHD officers; in particular by involving the RHD Training Centre in the planning, co-ordination and management of all FAP funded training. Direct exposure to RHDTC for all RHD officers (e.g. entering RHD survey data into RMMS and BMMS or review of Environmental Impact Assessments); and Structured on-the-job training for officers in both revenue and development posts. Nearly all FAPs have funds allocated in the DPP (PP) for training, with some designated for overseas training and some for local training. The PCUs and PIUs require support to ensure that training is planned and implemented effectively. Continued management and administration of FAP training programmes through the RHDTC is considered vital for the sustainability of staff Development in RHD. Therefore, the Senior Management Committee of the RHD decided in its 15th meeting to issue instructions to channel FAP training funds through the RHDTC. The ToR in this manual details the requirements for channeling funds through the RHDTC. This shall be written into all future donor requests, Aide Memoirs, DPPs and TAPs. This shall also follow the RHD Training Policy, which was approved by the Secretary MoC in 1999, and applies to both revenue and development posts in RHD. The overall aim of Training and Human Resource Development (HRD) in RHD should be to develop the whole of RHD. In order to achieve this there needs to be improved integration of FAPs within RHD. This requires equal opportunities for posting to FAPs for all RHD officers, and then maximise the transfer of this experience through postings from FAPs to RHD headquarters revenue posts. This will help enable more work to be delegated from FAPs to relevant RHD functional units in the future. The new structure for RHD consists of five Headquarter Wings/Zones and seven Field Zones, each headed by an Additional Chief Engineer who reports Directly to the Chief Engineer. In addition two ACEs will be assigned to manage foreign aided projects one for World Bank Projects and one for Asian Development Bank Projects. The Management Services Wing is in charge of all the central administration and establishment function, Management Information System (MIS), Human Resource Development (HRD), Estates, Audit and Accounts. Key responsibilities of the wing are:To establish an effective management and human resources development systems to guide for promotion, posting, training and development of all RHD personnel. To review the activities of RHD for computerization and existing management information system and to take necessary steps in providing comprehensive and reliable MIS system. To ensure that the RHD Web site (www.rhd.gov.bd) and all the infrastructures related to Information and Communication Technology (ICT), e.g. servers, workstations, Local Area Network (LAN), Metropolitan Area Network (MAN), Radio Link etc. are maintained properly and reliably. To campaign and encourage all the RHD officers and staffs to use E-mail facility for cheaper and faster communications and the RHD Web site for proper and handy information about their activities. To ensure that records of all lands and buildings are maintained appropriately and Audit and Accounts procedure are maintained effectively. The objective of the Management Services Wing is to provide RHD with an integrated management of common services such as Human Resources, Financial Systems, Administration, Training, Management Information Systems, Security, Estates Management and Legal procedures. a) To provide an effective and efficient Human Resources function for the promotion, posting and personal development of all RHD personnel. b) To provide a comprehensive MIS including intranet and internet facilities for RHD. c) To provide effective management of all RHD budgets and finances. d) To provide appropriate training to all RHD personnel to ensure their efficiency and effectiveness. f) To provide effective management of all RHD lands and buildings. g) To provide an efficient and effective security service. The total staffing for the Wing is 614 persons comprising 54 Class I officers, 14 Class II officers, 212 Class III and 334 Class IV staff. 54% of all the personnel in the Wing are related to Security duties and 264 of the 334 Class IV staff are Security Guards. b) Establish and update a comprehensive personnel management database. c) Formulate and periodically review an approved charter of duties for each post in RHD. d) Establish and operate an effective transfers and postings system within RHD giving due consideration to the need to develop specialist resources. e) Manage the utilisation of security manpower to protect key point installations and those RHD Offices that require high security. f) Establish and update a comprehensive MIS network within RHD Headquarters and simplified networks within the Zones, Circles, Divisions and Sub-divisions. g) Manage all MIS operations. h) Manage the use of computer resources in RHD, including the management of all hardware and software. i) Compile and analyse accounting information and ensure budgeting and accounts procedures are followed throughout RHD. j) Revise and update budgeting and accounting procedures as required. k) Liase with the Chief Accounts Officer of MoC. l) Conduct an Annual Training Needs Assessment Survey for RHD. m) Conduct CDP and other courses for all RHD personnel. n) Procure both local and overseas training courses. o) Organise various seminars, conferences, workshops etc. for RHD personnel. p) The Law Officer will address the legal issues relating to land acquisition, land records, encroachments, trespassing, litigation, etc. This will include arbitration and governance issues. q) To manage the utilisation, maintenance, disposal and acquisition of RHD premises and land (excluding lands within the road reserve). The Planning and Maintenance Wing is responsible for all aspects of planning, programming, procurement, maintenance and monitoring of road and bridge projects.The Wing is currently using state of the art systems for the establishment of annual maintenance programmes designed to ensure that the value of the RHD’s Road and Bridge Assets are maintained and enhanced in a cost effective manner.. The Network Management Wing was established in 1998 following the re-organisation of the former Planning & Development Wing. Some new circles were created with new roles to reflect the current functions of the wing and the growing emphasis in maintenance. The processes and procedures are developed from those under the former wing structure. Under the reorganisation proposal of 2003 it was decided that the name of the wing should be changed Maintenance Wing to better reflect the functions of the Wing. The objective of the Planning and Maintenance Wing is to contribute to the overall strategy of RHD by providing a high level of service, in the effective planning and management of a programme of works on the RHD road network. This involves close liaison with the MoC, the Planning Commission and RHD field divisions to ensure that the work is managed from conception to physical completion whilst ensuring the optimum utilisation of funds. a) To maintain an up to date accurate and reliable inventory, including the physical attributes, of the Department’s roads and bridges. b) To contribute to the RHD policies and long-term development plans by using available road and bridge data including traffic, economic and social parameters. c) To present prioritised listings and short-term and long-term programmes for road maintenance and development projects designed to optimise the use of development and maintenance funds. d) To provide assistance with the development of annual budgets for the maintenance of roads. e) To submit Development Project Proposal (DPP), PP and Technical assistance Project proposal (TPP) documents for consideration by the MoC and the Planning Commission. f) To provide advice and assistance to the Department in all procurement issues. g) To provide effective and timely responses to emergency situations (floods, cyclones, earth-slips etc.). h) To provide an interface with other wings, circles and field zones as appropriate in the development of plans incorporating road safety, environmental and social issues. The Planning and Maintenance Wing consists of six Circles each headed by an officer of Superintending Engineer Level. The total proposed staffing for the Wing is 344 persons comprising 79 Class I officers, 25 Class II officers, 171 Class III and 69 Class IV staff. a) Collect, collate, review and monitor data on the entire network included in the RMMS. b) Undertake additional surveys as may be necessary to carry out economic or other analyses in the planning process. c) Apply HDM-4 for the analysis of maintenance, improvement and development programmes in order to optimise the use of available financial and other resources. d) Develop annual & multi-year programmes of maintenance & development works (including foreign aided projects) in consultation with the planning authorities in the MoC and the Planning Commission. e) Provide guidance on future investment alternatives to the Ministry of Communications, the Ministry of Finance and the Planning Commission based on economic optimisation analyses. f) Prepare recommendations for any proposed future expansion of the network including commissioning reviews of environmental, ecological, hydrological and social impacts of the proposed construction or acquisition. g) Prepare PCPs, PPs and TAPPs using data available from the RMMS and HDM-4 analyses. h) Maintain monitoring systems for revenue and ADP projects including those funded from external resources. i) Carry out the packaging of annual periodic maintenance programmes, procure contractors and consultants for undertaking large scale periodic maintenance works and monitor the execution of these works. j) Provide procurement assistance to other circles and field divisions for works and services contracts including: Studies, Surveys, Supervision and Construction for Routine and Periodic Maintenance, Improvement Works and New Construction. k) Undertake mid year reviews of progress and if appropriate prepare re-allocations of funds to ensure efficient utilisation of resources. l) Develop a coordinated approach to programme development involving all circles within the Wing whilst ensuring the highest possible service to customers. m) Establish adequate funds for the operation of the Wing to meet the objectives stated above by securing budgets based on actual operational needs. n) Establish increased funding for road & bridge maintenance on a long term basis. The Bridge Management Wing is responsible for all aspects of data collection, surveys, planning, construction and maintenance of bridges on RHD roads. The Bridge Management Wing maintains a close liaison with all other RHD wings to ensure that all bridge works are well managed from conception through to physical completion and are then appropriately maintained to optimise the use of funds. The Bridge Management Wing is a new wing established in 2000 evolving from the Bridge Design Circles East and West. In addition new circles have been established to manage data collection, surveys, planning, construction and maintenance of bridges on RHD roads. The objective of the Bridge Management Wing is to contribute to the overall strategy of RHD by providing a high level of service, in the effective planning, design and management of bridge works on the RHD road network. This involves close liaison with RHD wings and field divisions to ensure that all bridge works are well managed from conception through to physical completion and are then appropriately maintained to optimise the use of funds. a) To maintain an up to date accurate and reliable inventory, including the physical attributes and conditions, of the Department’s bridges and culverts. b) To contribute to RHD policies and long-term development plans by using available bridge data to plan the management of the bridge stock effectively. c) To present prioritised listings and short-term and long-term programmes for bridge maintenance and development projects designed to optimise the use of available Government finance. d) To develop and implement Quality Control and Quality Assurance schemes for bridge design, maintenance and construction. e) To undertake and procure design and other services, monitor progress and manage programmes effectively for maintenance, replacement and new construction of bridges. f) To draft PCP, PP and TAPP documents to be presented by the Planning & Programming Circle to the MoC and the Planning Commission. g) To provide effective and timely responses to emergency situations involving bridges (floods, cyclones, earthquakes and collapses). h) Produce annual report on the condition of the RHD Bridge Stock. The Bridge Management Wing consists of four Circles each headed by an officer of Sperintending Engineer Level. The total proposed staffing for the Wing is 277 persons comprising 47 Class I officers, 20 Class II officers, 156 Class III and 54 Class IV staff. a) Establish bridge design, construction and maintenance standards to be applied to all bridgeworks within the RHD. b) Collect, collate, review and monitor data on the entire RHD bridge stock to be included in the RMMS. c) Develop a systematic approach to bridge management. d) Procure or undertake surveys for the planning, design, maintenance and construction of bridge works. e) Procure (from RHD or otherwise) necessary economic studies of new and replacement bridges. f) Prepare recommendations for any proposed bridge replacement, major repairs and provision of new bridges including commissioning reviews of environmental, ecological, hydrological and social impacts of the proposals. g) To liaise with other wings, circles and field zones in relation to road safety, environmental and social issues related to Bridges. h) Procure consultants for the design and supervision. Check and review designs to ensure they meet all the specified requirements. i) Develop annual & multi-year programmes for maintenance & development of the bridge stock (including foreign aided projects) in consultation with the planning authorities in the MoC and the Planning Commission. j) Prepare draft PCPs, PPs and TAPPs for all proposed bridge projects. k) To develop annual budgets for the maintenance, replacement and new construction of bridges. l) Procure contractors for execution of bridge maintenance and construction works. n) Establish increased funding for bridge maintenance on a long term basis. o) Prepare monthly and annual reports on all bridge related activities. The Technical Services Wing provides in-house and out-sourced services in road design, environmental and social impact mitigation, road safety, quality control and research. The Wing maintains and updates road design standards and ensures that all roads and bridges within RHD afford the highest standards of public safety. In addition, the Wing ensures that social and environmental impacts of road and bridge construction are minimised and seeks to raise standards of construction through research and quality control. The Technical Services Wing was established in 1998 as part of an interim re-organisation of the RHD. The main aim of the restructuring was to focus the service providers within the RHD into a single Wing that would provide in-house services where possible and manage outsourcing of such services when resources were inadequate to meet demand. Under the re-organisation of 2000 it was decided to remove Training and Bridge Design functions from Technical Services. The objective of the Technical Services Wing is to ensure the best practices in RHD by establishing design and construction standards and providing in-house and outsourced services in road design, environmental and social impact mitigation, road safety, quality control and research. a) To maintain and periodically update road design and other standards for all RHD operations. b) To provide or procure design services for road rehabilitation, improvements and new construction. c) To ensure all roads, bridges and other facilities within RHD afford the highest possible standards of safety to the public and that environmental mitigation measures are provided and maintained throughout the network. d) To ensure that the impact of new construction or improvements minimise the social impacts to the population through participatory processes for land acquisition and resettlement. e) To seek to raise standards of construction through research and quality control and the implementation of appropriate design standards, technical specifications and contract documents. f) To contribute to environmental improvements, protection of embankments and the demolition and utilisation of RHD land through the effective management of an arboriculture program. a) Develop a service oriented culture within the wing focused on service to customers through provision of in-house, services and outsourced consultancy contracts. b) Establish the framework wherein services (investigation, survey, design and supervision) can be provided to the Department. c) Develop a demand for Technical Services and support from the other Wings by promoting the Wing’s capabilities throughout RHD. d) Identify and develop design and quality standards (geometric, pavement, bridge, environment & resettlement, safety etc.). e) Undertake (or procure) detailed design services of roads. f) Undertake or procure additional surveys as may be necessary to carry out designs. g) Develop and regularly update specifications and contract documents to keep RHD in the forefront of technological improvements. h) Establish and periodically update standard test procedures for quality control of all standards and types of work. i) Develop and apply quality control audit systems on all RHD projects (both development and maintenance). j) Monitor the operation of field and contract laboratories and ensure equipment is adequate for the purpose and correctly adjusted. k) Manage plantations and replanting through own resources and outsourced providers. This includes liaison with other departments and ministries involved in tree planting. l) Carry out environmental and resettlement audits on prospective and ongoing projects, advise projects on environmental & resettlement issues and monitor all environmental and resettlement activities. The Mechanical Zone is responsible for the provision, operation and maintenance of equipment, vehicles and ferries required to undertake the activities of RHD. The Zone follows commercially sound practices so that in the future it may become a private sector organisation. The Zone hires out equipment at commercial rates. The Mechanical Zone of the Roads and Highways Department is responsible for the provision, operation and maintenance of equipment, vehicles and ferries required to undertake the activities of the Roads and Highways Department. The activities of the Roads and Highways Department have grown rapidly in recent years. This growth has been accompanied by changes in the Department’s operating systems and contract procedures and further changes are to be expected. In order for the Mechanical Zone to continue to provide an effective service to the Department further modifications are now required to the operations of the Mechanical Zone. This Policy Statement outlines the rationale behind the various activities of the Mechanical Zone. These activities are designed to ensure the Mechanical Zone can continue to provide the mechanical services required by the Department, now and in the future. To provide cost effective and efficient support to the construction, operational and maintenance activities of the Roads and Highways Department through the procurement, operation and maintenance of equipment, vehicles and ferries in order to provide maximum benefit to the People of Bangladesh. The Mechanical Zone will follow commercially sound practices to realise the long-term goal of becoming a private sector operation. a) To establish a plant pool in accordance with a defined business plan to hire out equipment at commercial rates to the growing number of contractors working under FIDIC type of contracts including foreign aided schemes. b) To provide the travelling public with a safe cost effective and reliable ferry fleet. c) To develop and establish a core fleet of equipment for routine maintenance operations at sub-division level utilising manageable serviceable equipment. d) Develop a coherent management strategy for the Department’s fleet of transport vehicles including systems for their procurement and replacement. e) Dispose old unserviceable equipment, ferries, vehicles and spares. The Mechanical Zone consists of seven Circles each headed by an officer of Superintending Engineer Level. The total proposed staffing for the Wing is 1,518 persons comprising 52 Class I officers, 68 Class II officers, 856 Class III and 542 Class IV staff. The detailed figures are shown on the attached sheet. These numbers do not include mechanical personnel who are in 1st line workshops or ferry operations staff who are under the control of the civil field divisions. In order to achieve the outputs the following activities must be undertaken. a) Establish a core equipment fleet for routine maintenance to be carried out using departmental labour equipment and materials. For effective routine maintenance each sub-division must be equipped with essential equipment in a serviceable working order. b) Establish a Plant Pool for hire of equipment, in accordance with a defined business plan, at commercial rates to the contractors working under FIDIC type conditions. Prevent hire of equipment at sub-commercial rates from other Government sources. The RHD plant hire equipment pool will act as a catalyst for the development of private pools. c) Phase out the provision of equipment, which is currently under control of field divisions and provided under Form 2911 contracts. d) Standardise on a limited range of well-maintained equipment and vehicles. Dispose of uneconomic, unserviceable and scrap equipment commencing with all items of equipment over 25 years old and spare parts not utilised for the past 10 years. e) Implement a Roller Rehabilitation Programme utilising the existing workshop facilities and the manpower of the Mechanical zone. Initially rehabilitate 100 Rollers and distribute 50% to the plant pool and 50% to the sub-divisions for use on routine maintenance. f) Develop a business plan for operations of ferries and carry out its effective implementation on commercial lines. Review ferry contracts and maximise income generation from leasing without any detrimental effects to the working lives of the ferries whilst offering an improved and safer service to the travelling public. h) Implement a replacement programme for obsolete and unsafe ferries. i) Review vehicle management systems and introduce procedures for procurement, operation, maintenance and replacement of vehicles. Secure budgetary provisions for the effective management and replacement of vehicles. j) Further develop computerised management systems for equipment, ferries and stores. k) Undertake appropriate training of personnel and rotate staff within the Zone to ensure retention of specialised technical and management personnel in the Zone. l) Review of the Zonal organisation and procedures to ensure that it is consistent with the new operational requirements. Road and Bridge construction and maintenance activities of RHD are carried out through seven Zonal offices which manage and execute operational works at the field level through Circle, Divisional and Sub-Divisional offices. The Zonal offices supervise 16 Circle operational offices which in turn control 65 Divisions, and 131 Sub-divisions. Each Zonal office is headed by an Additional Chief Engineer who represents the Chief Engineer and oversees all development and maintenance works within the Zone. Under each zone there are two or more Circles which are each headed by a Superintends Engineer. Each Circle is in charge of a number of Divisions each headed by an Executive Engineer and each Division has two more Sub-Divisions each under the charge of a Sub-Divisional Engineer. Almost all field works are carried out by Private Contractors although some minor maintenance works are carried out by Departmental labor. At the present time the RHD are introducing a number of new contracts systems into the field operations with a view to improving the quality and efficiency of the works. There is also a change in emphasis and funding from construction to maintenance operations. The objective of the Zonal offices is to ensure works programmes are carried out according to standardized procedures and that the budgets are spent effectively and appropriately ensuring quality during all phases of construction. a) To ensure that administration and management of the Zonal operations are carried out efficiently. b) To propose and coordinate, with the appropriate HQ Circles, annual work programmes for maintenance and development. c) To ensure effective maintenance of roads and bridges through operations and division and sub-divisional levels. d) To ensure completion of development works of roads and bridges through operations and division and sub-divisional levels. e) To monitor foreign aided projects within the jurisdiction of each Zone. f) To coordinate Mechanical activities including equipment and ferries with the Zonal Mechanical Circles. g) To ensure that updated accurate accounts are available. The Zonal Operations consists of seven Zones each headed by an Additional Chief Engineer. The total proposed staffing for the all the Zones 4,517 persons comprising 308 Class I officers, 575 Class II officers, 2,062 Class III and 1,572 Class IV staff. a) Compile, analyse and summarise field activity reports from all the circles within the Zone into a consolidated progress report for the Zone. b) Carry out all routine and periodic maintenance works through the dedicated teams. c) Carry out all normal development works through dedicated teams. d) Implement foreign aided projects attached to the Zone. e) Assist the Head Office HDM and Bridges Circles in carrying out surveys on the condition of roads and bridges. f) Coordinating the operation of plant, equipment and ferries in the field through the Zonal plant pools and in cooperation with the Mechanical SEs. g) Conduct flood damage and other emergency surveys and carry out emergency works as required. h) Maintain all accounts and prepare annual budgets. The RHD Road and Bridge Asset Management System RAM was designed as a comprehensive annual programme of procedures essential for the effective maintenance management ofthe RHD network. RAMS brings together all RHD’s current databases and analytical procedures. The special feature about RAMS is the RAMS map: a single GIS-based map which combines all relevantinformation and tells the Decisions makers where to allocate funds for maintenance and development. The Central Management System CMS for RHD was designed and implemented starting in 2004, linking for the first time physical and financial reporting, based on “earned value analysis”. It aims to improve the accountability and efficiency of all RHD field divisions, by reporting directly on all physical and financial progress. Reports from CMS are accessible to all senior managers of RHD, and are being submitted to Ministry. Reports from the CMS are publicly accessible through the RHD website. A process of financial management reform was initiated in early 2006. Centred on the new RHD Financial Management Unit FMU, the key task is to run the RHD Budget Committee and to prepare the annual submissions for the Medium Term Budgetary Framework MTBF. The organisation of RHD must be closely linked to the management policies, systems and procedures. The Figure ‘RHD Documentation Framework’ (Click on the figure to enlarge) shows the hierarchy of management information required to define the organisation and the procedures which are required for effective operations. The ‘Land Transport Policy’ is seen to be the guiding document for all issues concerning land transport. These activities come under the auspices of either the Ministry of Communications or the Ministry of Local Government Rural Development and Cooperatives. The Ministry of Communications Policy is a sub-set of the Land Transport Policy covering roads and highways (mainly through RHD), railways (through BR) and the management, regulation and operation of road transport (through BRTA and BRTC). The Roads and Highways Department Strategy is designed to satisfy the requirements of the Ministry ofCommunications Policy in respect of those activities which are the remit of the RHD. To support the Roads and Highways Department Strategy, a separate strategy has been prepared for each of the Wings and Zones within the Department. Two types of documents have been defined to assist in the achievement of the activities within the Wing/Zone strategies. The two document types are Circle Operational Plans and Circle Management Manuals. The Circle Operational Plans contain details of the Objectives, Outputs and Activities of each Circle within the Wings/Zones together with details of the Personnel and other Resources required. Each Circle Operational Plan is supported by an Operational Budget which is essential for the successful implementation of the Plan. The Management Manuals contain operational procedures and regulations and job descriptions for the various grades of personnel and for specific posts. The sum total of these documents within RHD form the “Roads and Highways Department Management Plan”. The Roads and Highways Department Management Plan is not a static document, it must be changed as the Department changes and portions of the document, especially the Circle Operational Plans and the Management Manuals, will need regular updating. Under the old system, requests for the Revenue Budgets were generally based on the previous years budget with some allowance for inflation. Some variations occur from year to year to meet specific requirements. The Annual Development Budget is based on requests for funding from the field Zones and priorities perceived by the Ministry, RHD Headquarters and donors. Development projects are processed through a system established by the Planning Commission. The Revenue Budget is largely expended on Routine and Periodic Maintenance of roads, bridges and buildings. In addition it is used to fund operations and maintain equipment and ferries. The RHD annual Revenue Budget is currently of the order of Taka 250 crore per annum. The ADP Budget, is largely allocated to upgrading, rehabilitation and new development works. Some of these items may be considered as periodic maintenance. The ADP budget is currently of the order of Taka 1,150 crore (US$230m). The current RHD budgets consist of the Revenue and the Development (ADP) budgets. The Revenue Budget is often referred to as the maintenance budget. This is an incorrect interpretation, as only a small proportion of the Revenue budget is available for road and bridge maintenance. The Revenue Budget in addition to Routine and Periodic Maintenance of roads, bridges and buildings is also used to fund the operation and maintenance of equipment and ferries. The RHD annual Revenue Budget is currently of the order of Taka 290 crore per annum (US$ 58 million). The Annual Development Budget is project based and is largely focused on upgrading, rehabilitation and new works. Some of these items may be considered as periodic maintenance. The ADP budget is currently of the order of Taka 1,670 crore (US$ 330 million). Hence, the Development Budget is currently about 6 times the size of the Revenue budget. All decisions regarding budget submission, distribution and allocation are now taken by the Budget Committee of RHD. The Budget Committee is the principal arbiter of all budget decision-making for RHD. To achieve its objectives, the RHD Committee meets at regular intervals, as well as on an ad-hoc basis when circumstances dictate. It must ensure that all decision making is soundly based on objective criteria with detailed breakdowns of all budgetary amounts available for review and discussion. The Budget Committee will gradually assume its full role in departmental decision-making and management as intended in its Terms of Reference. A Medium Term Budgetary Framework (MTBF) is a strategic mechanism adopted at the highest level of Government for Ensuring that resources available are utilised in line with agreed government policies and priorities. MTBF is an essential tool for ensuring that all the likely future expenditure needs of an organisation are properly considered, properly measured (in both physical and financial terms) and realistically planned. RHD has one of the largest budget allocations in all of Government. Many of its project commitments span two or more years. RHD will therefore greatly benefit from the effective operation of this MTBF approach, in which budget provisions are made for a three year time frame. Wing and Zone must give due consideration to these issues. The RHD Mechanical Zone is responsible for 2,626 items of equipment. Of these items 1,486 are over 20 years old and 1,102 are out of service. The Mechanical Zone currently employs about 1,500 staff of which 219 are either class-1 or class-2 employees the annual revenue budget for equipment is normally about Taka 6 crore (US$1.2m) although in 1997/98 this was enhanced to Taka 17 crore (US$3.4m) to enable the purchase of some new items of equipment. The 1998/99 budget is Taka 12 crore (US$2.4m) for similar reasons. As a result 20 road rollers, 10 soil compactors and 6 mini asphalt plants were recently procured and a further 38 items of compaction equipment have been approved. Computer systems have recently been installed within the Mechanical Zone. These have significantly improved the management of equipment, ferries, stores and spare parts. Currently most mechanical equipment is allocated to field divisions and is under their day to day control. 2 . Administrative Rules and Regulations. on Routine and Periodic maintenance.Not maintaining roads has a cost to the economy. National Economic Growth is probably slowed by about 1% of GDP each year. RHD has a World Class Road Management System. This is being used with State-of the-art analysis software to identify where it is best to spend the limited budget. The analysis has shown that there is a huge backlog resulting from lack of appropriate Asset Management in the past. Investment of Taka 2,400 crore is needed in the short term to arrest the deterioration in the condition of the roads. This sum is rising each year at an accelerating rate whilst maintenance continues to be under funded. Long term maintenance needs are for Taka 500 crore per annum. This is a commitment that will never disappear. MoC and RHD have taken the initiative to direct about Taka 150 crore to Periodic Maintenance from the Revenue Budget. World Bank and ADB have committed funds to Periodic Maintenance over the next 4 to 5 years. Other agencies are interested in investing in this work.